My grandmother Viola Svart passed away last month. She was 101 years old and ready to join my grandfather, but I still mourn her as I celebrate her. She was born a two-month preemie in an Oregon logging town, grew up to go on strike for over a year during the Great Depression as a young woman, and then raised four children while waiting up each night for my firefighter grandfather to come home alive. She was among the strong women who taught me to stand up for my rights, and she never stopped. In recent years she joined DSA and organized neighbors in her assisted-living facility to support Bernie Sanders. She was an ordinary woman who did extraordinary things, but thinking about her while I was in California between the teacher strikes in Los Angeles, Denver, and Oakland, reminded me that this is what we do. Working-class people have been fighting and striking for generations—always facing down institutional and vigilante violence from the ruling class. I met a DSA member my mother’s age at the Knoxville pre-convention conference who remembers hearing Florence Reece, author of “Which Side Are You On?,” sing miners’ union songs. Collective action is how we go to battle in the class war, and our strength has ebbed and flowed, but it’s time to marshal the lessons of our elders and the energy of our youth and win this once and for all. The planet cannot wait. In New York city, DSA pivoted from a successful state senate campaign in 2018 to respond immediately when Amazon made a surprise November announcement that it was setting up a headquarters in Queens. In addition to daily canvasses, the chapter organized direct actions and lobbying, in conjunction with coalition partners, and raised concerns not just about gentrification, but also about Amazon’s collaboration with Immigration and Customs Enforcement and refusal to allow its warehouse workers to organize a union. Amazon turned tail and ran, and now other cities are renewing their fight against Amazon and corporate welfare in general. Meanwhile, in West Virginia, teachers, including DSAers, went on a strike against the privatization of their schools–and won after just one day. We’re standing together across our differences of age, race, and geography. After decades on the defensive, we in the working class are remembering our power, and just in time. Donald Trump and the global fascist movement tell us the solution to climate change is militarized borders and scapegoating, while Wall Street Democrats tell us to recycle more of our household trash while letting the massive fossil fuel industry drive us off the climate cliff. It’s time for us to take action to protect ourselves from the capitalist class. How to prepare for climate change is one of the debate topics at our regional pre-convention conferences in Los Angeles; Knoxville; Albany, N.Y.; Denver; Washington, D.C.; Boston; Dallas; Portland, Ore,; and Chicago. Hundreds of members have come together so far to look inward by reviewing the national convention timeline and process to prepare for August and outward by learning skills to build power and debating what strategies and tactics will best help us win. Spending time with comrades from across states and chapters is a huge plus. I hope to see you if your regional conference is coming up. Talk to your chapter leader(s) or, if you are at-large, the national office, about pre-registering. These official pre-convention conferences all feed toward our 2019 national convention, August 2 – 4 in Atlanta, Georgia. Check the convention website for more details and to sign up for the most up to date convention information via email: dsausa.org/national-convention. February 2 – April 14: pre-convention conferences in Los Angeles, Knoxville, Albany, Denver, Washington, D.C., Boston, Dallas, Portland, Ore., and Chicago. Now through March 30: chapters may do drives for Movement Builders monthly members (20% of the dues shared with chapters) or to renew annual memberships, so that members will be included in the delegate apportionment count. March 1 – April 30: at-large members nominations period. March 2 – May 2: any member or group of DSA members in good standing may propose changes to the DSA national constitution or bylaws. After April 2: the national office will inform local chapters of the number of delegates apportioned to them based on the formula of 1 delegate for each 51 members. April 2 – June 2: people running for the National Political Committee must fill out a candidate questionnaire. April 2 – June 2: any member or group of DSA members in good standing may propose political or organizational resolutions. April 2 – June 18: local chapters hold delegate elections and notify the national office of results. Another debate topic at the conferences, on our national website, and most likely in every chapter is whether to endorse Bernie Sanders for president. By the time this copy of Democratic Left hits your mailbox or inbox, we may have made a decision, but I’ll take space now to outline our draft campaign plan should we endorse, because it flows from our always helpful-to-review national electoral strategy. First, any campaign would be centered around core demands and our issues, such as Medicare for All and a Green New Deal. In other words, it would be movement centered—not merely around the candidate himself—and complementary to other issue work. Second, it would be closely connected and carried out in conjunction with our labor work and our campus work. Third, we would do constant mass political education about capitalism and socialism through social and other media. Fourth, we would build our own campaign infrastructure in order to ensure that after the election we have an organized constituency to keep fighting for transformative reforms. And fifth, the work would focus on chapter capacity building, training. and support so that chapters can organize based on local conditions and build grassroots socialist power. Learn more about the draft campaign here. 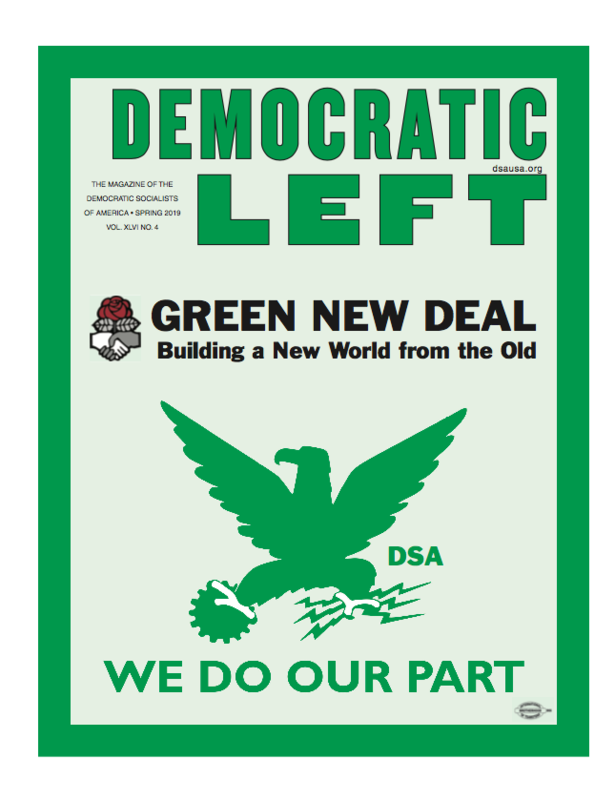 This issue of Democratic Left, guest edited by Laura Colaneri, Meagan Day, and Don McIntosh, focuses on the Green New Deal. Why climate change is a socialist issue—and why only a mass working class-movement can save us all—are the questions we ask and answer in this issue. Meagan Day walks through the bill put forth by Congresswoman and DSAer Alexandria Ocasio-Cortez and Senator Ed Markey and reminds us that a single piece of legislation is just the beginning. Benjamin Fong carries forward that theme of necessary transformation: The capitalist class is the obstacle we face, and saving ourselves means taking back our world from them. Matt Huber reminds us to tax the rich, not feel guilty about our consumer choices, because democratizing energy production is the only way to reach the scale we need. Chris Maisano goes further. The full employment necessary to stave off the climate crisis is both a smart political demand and a strategic goal for socialists. A working class aware of its own critical role in society and production is in a powerful position. Erik Apland gives us a glimpse of our fiery future if we don’t win this class war, and Anna Kastner and Eric Ruud present case studies of DSA chapter campaigns to democratize public utilities on opposite sides of the country. Finally, Natasha Fernández-Silber describes Detroit DSA’s work with Congresswoman and DSAer Rashida Tlaib to call for a new Great Lakes Authority federal agency and transition of a soon-to-be shuttered General Motors plant to large-scale green manufacturing. Ben Fong points out that “we’re at a point in history when no environmentalist who is not also a socialist can be taken seriously as an environmentalist.” As we participate in strike picket lines and direct actions in congressional offices, let’s make sure to remind folks that only we have the power to save ourselves.